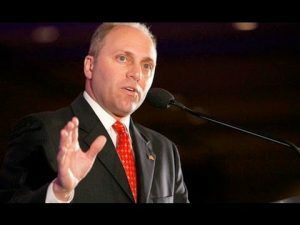 A top House Republican, Steve Scalise of Louisiana, was shot by a rifle-wielding gunman Wednesday at a congressional baseball practice just outside of Washington. Several other people were also believed to have been hit, according to a lawmaker who witnessed the shooting. Scalise, the House majority whip, was in stable condition at George Washington University Hospital, according to one congressional aide. His injuries were not believed to be life-threatening. It was not known the condition of the others who were shot. Rep. Roger Williams, R-Texas, was taken from the field in a stretcher, Fox News reported. It was not clear if Williams had been hit by a bullet.